With with a healthy dose of roots and rocks over ever-changing ups and downs., we’ll cover the classics like Belle Isle and Forest Hill Park before exploring the historic downtown and snapping pictures along the James River. A dip in the beautiful river is a definite possibility in the summer months to cool us down. To balance that out, there are sections of smooth and buttery flow at Pocahontas State Park, only 30 minutes southwest of the city. Everything here is wrapped up in pockets of lush green flora, where it’s easy to feel like you’re lost deep in the woods..
Whatever type of singetrack you prefer, you are sure to find it on the 75 miles of beginner to expert trails at your fingertips. With cozy accommodations included, along with healthy and delicious breakfasts and lunches, this weekend will recharge you and make you smile. We encourage you to settle in at your accomodations in historic Richmond city on Friday Eve. Check-in is any time after 4:00 p.m. on Friday evening. Please visit the Logistics tab for accommodation address and details. Enjoy multiple dinner options a short walk or ride before catching some Z’s for your weekend packed full of adventure! On Saturday your Guides will meet the group for a hearty breakfast at 830am in the city close to the trails. We’ll have a group meet and greet and review the exciting itinerary for the weekend of adventure. Our first stop will be the local bike shop to pick up bike rentals for those who booked them. We will then head over to the James River Park System to review the fundamentals of mountain biking in efforts to break bad habits and establish new and improved ones! There is always something to learn. After warming up, we're off to ride the singletrack on both sides of the James River with periodic stops to take pictures on this scenic ride, ground zero for the Richmond mountain biking scene. 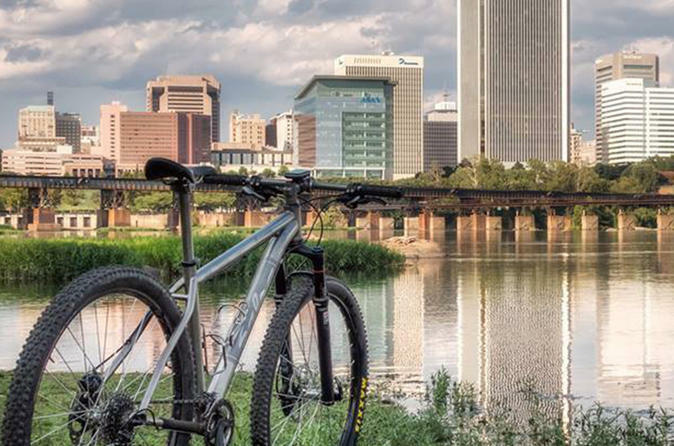 Over 50 miles of trails can be found in this urban, singletrack paradise and we'll hit some of the local favorites like Dogwood Dell, Forest Hill Park and North Bank. Lunch will be enjoyed at one of the many awesome restaurants close to the trails. The afternoon will be spent riding more of Richmond's amazing singletrack with a stop at the end for a celebratory drink at one of the local craft breweries that Richmond boasts. We'll return to the bike shop around 4:30 pm. For tonight's dinner, the options are plenty to choose from, all within walking distance, or an optional barbecue at Lorene and Jeff's home along Riverside drive. DAY 2 : (SUNDAY) POCAHONTAS STATE PARKAfter packing our bags and checking out of our rooms, we will meet for breakfast at 8:30 am. Today, we'll load up our bikes and head to Pocahontas State Park for the day. First we will hit the Morgan and Swift Creek trail system and sample both new and old singletrack trails, like the Blueberry Hills trail and the Morel Ravine Trail. After a full morning of riding, we'll have a delicious packed lunch along the trail. In the afternoon we will ride the scenic Lakeview trails and enjoy the back country experience they offer. We will return to the bike shop by 4:30 pm with giant smiles and toast to an incredible weekend of shredding Richmond!